Forty years gives you quite a perspective on the trends and changes in the landscape of how we think about ornament, design, preservation, conservation, art integration into the built environment, and applied industrial design effects on everyday life. 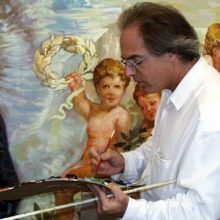 I started EverGreene in 1978 when I was twenty-four years old and all I wanted to do was paint murals. The studio has evolved, and I have matured along with it, except my passion for these subjects has only increased as the years and work go on. When I created the studio, my grand idea was that we would just paint murals and make public art. As it turned out, there was a lot of time in between commissions. In order to pay for rent and to keep the studio active, we took on every project that came our way. Exposing ourselves to other fields such as facades, masonry, fresco painting and plaster work. We painted signs, completed construction work, repaired brownstone facades, took interior painting commissions, etc. Slowly, in about the mid 1980’s, the preservation practice part of our studio evolved, changing our work for the better. As the Roman philosopher Seneca said, “Luck is what happens when preparation meets opportunity.” Well, EverGreene was very fortunate for many things as we first started out. We were lucky to have entrée in the New York real estate, architecture and interior design world and to learn from some of the greatest names of the era, at both the modern and classical ends of the spectrum including I.M. Pei and Parish-Hadley. We were also lucky that there was this ascent, a wave if you will, of “ornamentalism,” and we were able to ride that wave. Preservation was in its infancy and we were right there; ready to prove ourselves. 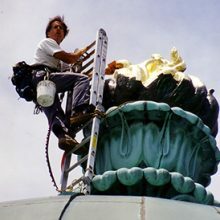 In 1980, we started painting Richard Haas murals and simultaneously helped design New York buildings in the style of old-school Parish-Hadley decorating techniques. During this time, it seemed our focus was real estate, murals and decorating, and I did not yet see how much we would learn and expand. Our first big break came in 1986 with then Vice President George Bush’s office. After that, we worked on the Library of Congress, which put us on the map. In the 1990’s decorative painting was really taking off, correlating with the movement towards theming, which gave us work at the casinos in Las Vegas and Atlantic City. Ultimately, we undertook similar projects around the glove in South Africa, the Middle East, the Caribbean and Macau.That was the thing about the nineties, and really, any golden age. The money and talent was in the field. It was an inspiring time, it felt like everyone involved in architectural arts, no matter where they were from, were ultimately speaking the same universal language of these shared visual perspectives. An eloquence of expression existed, in a way that I’m finding less of today. With design and ornament, there is a sense of history and evolution. Attitudes and concerns for the way ornament is applied or designed has shifted, but my interest in it hasn’t changed or faded at all. In the early-2000’s, the quantity and quality of projects shifted. On the upwards trends were Venetian plaster and digital printing. On the decline was ornament, with an increasing preference for minimalism, modernism and visual texture rather than pattern. The craftsman that I worked with and befriended in the height of the nineties all seemed to disappear, and to this day remain scarce. When I look back on the last forty years of EverGreene, I can’t pick out a favorite project—it is always the one I am working on now! You pour your heart and soul into each individual project and do your best work, and what we are creating at the end of the day, is art, which we hope will evolve. However, there are some projects that have stood out. 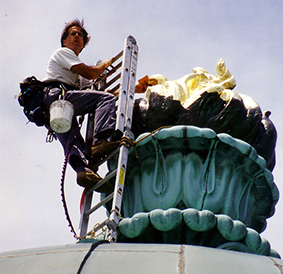 Working on the United States Capitol murals was a personal career highlight. The Meridian Opera House in Mississippi was an incredible project, as well as the Eldridge Street Synagogue, the Sacramento Cathedral, the Allen County Courthouse in Ft. Wayne Indiana, re-creating the 1926 Ohio Theatre Lobby in Cleveland, to name a few.As I look towards the future of EverGreene and the work that we do, I am excited and anticipate more great change in the industry. If you told my twenty-four year old self all of the incredible projects that we would do, all the communities we would help serve, I would not believe it. But at the end of the day, I hope to always remember the thrill I had in painting my first public art or restoring my first theater or church, and that the desire to provide and preserve art to be appreciated by communities continues.